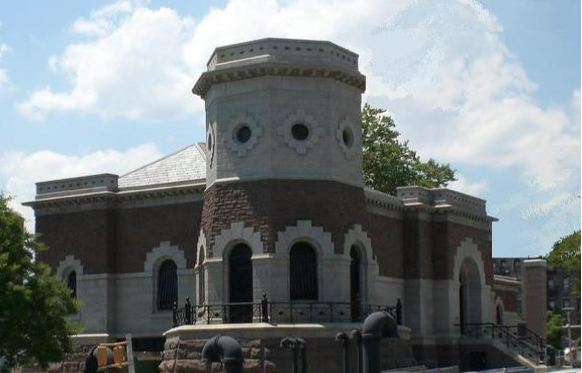 The New York City Department of Design and Construction (DDC) contracted PMS Construction Management Corp. (PMS) for Construction Management / Build services for the reconstruction and renovation of the 135th St. Gatehouse located within the grounds of the City College of New York in Manhattan. The 135th Street Gatehouse structure was extremely unique for the utilitarian purpose it once served. The Gatehouse was constructed to stand the test of time using massive masonry construction materials. The conversion of the structure into a state-of-the-art performing arts center posed unique and challenging solutions that involved design, staging, coordination and execution of the work. The established protocol required daily interaction by all team members to determine solutions that were dictated by differing conditions and to incorporate client requests as they were revealed at the project site. The integration of new construction into the old, created numerous challenges, due to the nature of the existing structure and materials that were used. The Contract Documents contained stringent Subcontractor qualification requirements due to the level of quality and workmanship required. All applicable construction activities were completed to standards and with the approval of the Landmark’s Preservation Commission (LPC). All construction aspects of the project were managed and coordinated by the PMS. The 135th Street Gatehouse site is approximately 19,500 sf. The area surrounding the existing structure contains a complex network of water distribution mains, valve chambers, manholes and associated appurtenances below grade. They include 48” and 84” active water mains that encircle half of the structure and are in close proximity of it. In addition, several goose-neck vents, some extremely large, are visible above grade and surround The Gatehouse. The site remains fully active by the “DEP”, the installations are centrally connected to the functioning water supply of New York City. Due to the active nature of the site, “DEP” required access to the installations twenty-four hours per day and seven days per week. The imposed “Work Exclusion Zone”, created very limited staging and storage areas, required for construction. All new installations necessitated close coordination with “DEP” and with the existing installations below grade. The primary activity during early stages of construction was excavation to allow the construction of two new floors below. The excavation required the removal of large granite blocks, that were used in the gatehouse construction. Access to the interior for removals was extremely limited. All excavated materials were removed through the south door opening, approximately twenty-four feet (24’) above the finished cellar floor elevation. During removals, four unforeseen and massive forty-eight inch (48”) gate valve assemblies were unearthed at the west (apse) end of the structure. Each of the valves, approximately the size of a small excavator , required demolition, dismantling and removal. It is noted that the design and new construction, was based on available historical documents and anticipated conditions. As-built surveys could only be verified after removals during selective demolition activities. Actual conditions necessitated redesigns and changes to construction that followed. Selective removal activities also required precise layout and cutting of stone elements, to allow for the new construction. The Aaron Davis Hall / 135th Street Gatehouse Project stands as a testament of construction possibilities. The successful completion of the project could be attributed to management and interaction of team members, close coordination, innovative thinking, and the will to execute and succeed. The old neglected structure was restored to it’s original glory and expanded to meet the clients needs. 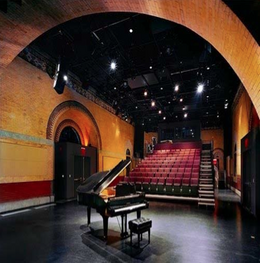 The obsolete structure was converted into a state-of-the- art, performing arts center, that is destined to become a premier showcase for culture and the arts. In addition, the structure stands as a welcome addition into the community. The success of the project is therefore multi-faceted and exceedingly accomplished all of the goals that were to be achieved.